In the first ever joint demonstration in the national capital by three most important sections of society that play a major role in producing the wealth of the country, lakhs of workers, peasants and agricultural workers from across the country are descending on Delhi to make the Mazdoor Kisan Sangharsh Rally on September 5 a historic success. The rally is being held under the joint leadership of the Centre of Indian Trade Unions (CITU), All India Kisan Sabha (AIKS) and All India Agricultural Workers Union (AIAWU). This unprecedented rally is being held to oppose neoliberal policies, the communal agenda and the authoritarian attacks by the BJP-led government at the Centre. The 15-point Charter of Demands include the following: Curb price rise and universalise the public distribution system; Concrete measures for generation of decent employment; Minimum wage of not less than Rs 18,000 per month for all workers; Stop anti-worker labour law amendments; Remunerative price for all agricultural produce at one and a half times the cost of production along with public procurement; Loan waiver for peasants and agricultural workers; Comprehensive legislation for agricultural workers; Implementation of MGNREGA in all rural areas and extending it to urban areas; Food security, health, education, housing and social security for all; No contractorisation; Redistributive land reforms and implementation of the Forest Rights Act; Stop forcible land acquisition; Relief and rehabilitation for the victims of natural calamities; and Reversal of neoliberal policies. The Delhi Rally will also hit out strongly at the communal agenda and authoritarian drive of the Modi regime. It will condemn the serial mob lynching and moral policing and the killing of progressive intellectuals in which the Hindutva terrorist outfit Sanatan Sanstha is on the mat. September 5 is, in fact, the first anniversary of martyrdom of activist journalist-activist Gauri Lankesh. The Delhi rally will also denounce the arbitrary arrests of human rights activists by the Modi regime. The rally will also condemn the repression let loose on the people and particularly on the Left by the BJP government in Tripura and the Trinamool Congress government in West Bengal. It will also express solidarity with the people of Kerala who are bravely fighting the flood aftermath. A reception committee with eminent economist Prof Prabhat Patnaik as chairman has been constituted. Camps are being constructed at Ramlila Maidan in Delhi and in Ghaziabad in Uttar Pradesh. The mammoth procession will start from Ramlila Maidan on September 5 at 9 a.m and will reach Parliament Street, where leaders of CITU, AIKS and AIAWU will address the public meeting. A massive campaign has been led throughout the country over the last few months for the success of this Delhi Rally. Crores of leaflets have been distributed, thousands of meetings have been held, hundreds of jathas have been organised in all states, despite the rains, which saw tremendous participation of the working people everywhere. The Delhi Rally comes in the background of a series of massive struggles of the working class and the peasantry over the last four years. On August 9, 2018, well over five lakh peasants and workers under the joint leadership of AIKS, CITU and AIAWU courted arrest at over 610 centres in 407 districts in 23 states across the country on August 9, 2018. This was by far the largest and most effective nationwide Jail Bharo struggle in the country in recent times. August 9, 1942 is a historic date in our freedom struggle, the day on which Mahatma Gandhi served notice on the British imperialist government to ‘Quit India’. Seventy six years later, on August 9, 2018, peasants and workers raised the central slogan “Modi Sarkar, Chale Jaao!” This was in recognition of the fact that the BJP-RSS government headed by Narendra Modi is without doubt the most anti-peasant, anti-worker and anti-people regime in the last 71 years of Independent India. It is also the most pro-corporate, communal and casteist regime so far. In 2015, a joint platform called the Bhoomi Adhikar Andolan (BAA) was formed during the successful struggle against the Land Acquisition Ordinance. 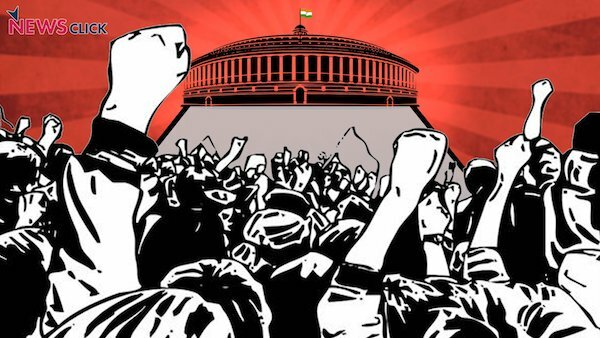 After state-level agitations and rallies in Delhi against the Ordinance and with intervention by the Left and other opposition parties in the Rajya Sabha, it had to be withdrawn in August 2015. The BAA has since been fighting on issues like killing of farmers by gau rakshaks, and against forced land acquisition for the Mumbai-Ahmedabad Bullet Train, the Salem-Chennai green corridor and the various Industrial Corridors and Freight Corridors proposals. The All India Kisan Sangharsh Coordination Committee (AIKSCC), a broad platform now comprising nearly 200 organisations, was formed after the Mandsaur firing in June 2017 by the BJP government in Madhya Pradesh, which killed six farmers. The two main issues taken up by this platform were farm loan waivers and remunerative prices for farm produce at one and a half times the cost of production as per the Swaminathan Commission recommendations. The AIKS is an important constituent of both the BAA and the AIKSCC. The AIKSCC held a Kisan Sansad and a Mahila Kisan Sansad in Delhi in November 2017 in which tens of thousands of farmers from across the country participated. Two Bills for liberation from farm debt and for fair remunerative prices were finalised. These Bills were supported by 21 opposition parties in a special convention. The Bills were introduced in Parliament in its just-concluded monsoon session by AIKS Joint Secretary K K Ragesh in the Rajya Sabha and by Swabhimani Shetkari Sanghatana leader Raju Shetty in the Lok Sabha. The formation of Jan Ekta Jan Adhikar Andolan (JEJAA)–a platform of class, mass and social organisations-in September 2017 resulted in the May 23, 2018 ‘Pol Khol Halla Bol’ actions all over the country, in which tens of thousands condemned the four years of the Modi regime. The AIKS took the independent initiative of organising four nationwide jathas, culminating in an AIKS Delhi Rally of several thousand peasants on their burning demands in November 2016. A large rally in Delhi was also subsequently held by the AIAWU. The struggles spearheaded by the Maharashtra and Rajasthan units of the AIKS in the recent past contributed greatly to building up the resistance of the peasantry at the all-India level. The remarkable Kisan Long March organised under the banner of the Maharashtra unit of the AIKS became a source of encouragement for the entire democratic movement in the country. The struggles in Rajasthan, Maharashtra, Karnataka and elsewhere succeeded in wresting concessions from the BJP and Congress-led governments in these states. Running parallel to these peasant struggles were the series of working class struggles led by the CITU and other trade unions throughout the country. These included the two massive All India Strikes on September 2, in 2015 and 2016 and culminated in a huge three-day sit-in struggle of lakhs of workers on Parliament Street in Delhi in November 2017. The upcoming September 5 Delhi Rally will be another major step forward towards worker-peasant unity and will give a further call for struggle. It will also be another blow under the leadership of the Red Flag that is aimed at the BJP-RSS-led central government.